Specially treated moist foam. 'Spitballs' are blown through the horn to give instantaneous cleaning. Standard size Spitballs are used for Trumpet, Cornet, French Horn and small bore Trombones. 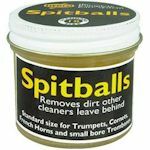 Large size Spitballs are for large bore Tenor Trombones and Baritone Horns.